A lot was riding on the 1961 Iron Bowl when Alabama pulled up to Legion Field a day before kickoff. Bear Bryant’s fourth Crimson Tide was undefeated, touting what many still consider the most dominant defense in program history. Since national titles were awarded at the end of the regular season back then, the finale with Auburn meant even more. So, what Alabama found when it arrived in Birmingham on the eve of kickoff was troubling. “It was like walking around on concrete,” said Bill Battle, an end on that 1961 team. Months of high school and college games on the turf not designed to modern standards left Legion Field a disaster. That’s what made Bryant’s response to the conditions so clever. It involved a network of state troopers, commitment to the cause and a last-minute secret weapon. Stacks of shoe boxes greeted Alabama players at breakfast the next morning. Only these weren’t football cleats. And as far as Gary White knows, their story has never been fully told. White was in his third season as head manager for Alabama’s football team in 1961. He had arrived in the Ears Whitworth era as an assistant manager and climbed the ranks under Bryant. After seeing the field, White remembers the conversation behind the scenes. The guys needed soccer shoes, Bryant determined. They had soft spikes that could navigate that mess. Assistant coach Carney Laslie was in charge of equipment and the plan to bring a football roster worth of shoes from a fairly obscure sport to the west side of Birmingham in less than 24 hours. That’s where Chief Joe Smelley came into the equation. One of the state troopers who famously guarded Bryant on game days was in charge of the highway patrol statewide. It’s safe to say he had some influence. They were coming from all corners of the state because no one store had close to enough in stock to satisfy this sudden and large demand. There was no way that effort could have been mobilized without Smelley’s help, White said. Any soccer shoe a sporting goods store stocked in football-player sizes wound up in Birmingham. Battle, who went on to become Alabama’s athletics director from 2013-17, remembers seeing the new kicks for the first time. This wasn’t even the first time Alabama made footwear adjustments on the fly that fall. A torrential downpour before the Mississippi State game in Bryant-Denny Stadium required the managers to unscrew all the normal cleats and replace them with longer ones. Alabama won that one, 24-0 on homecoming day. Those spikes wouldn’t work at Legion Field in the Iron Bowl, however. So, it was up to White and the managers to make sense of this airlift and get the soccer shoes unboxed and ready for the biggest game of their lives. Benny Nelson clearly remembers the sight of those soccer shoes in the Legion Field locker room. Nelson, who went on to be an All-American two seasons later, was then a third-string running back. He got a new pair of shoes that December day in Birmingham. Unlike the old leather shoes, the new imports didn’t need as much work to break them in. As Nelson remembered it, the muddy field was rolled “like you would a highway” and painted it. Apparently, the new shoes helped. They had grip where the old cleats did not. 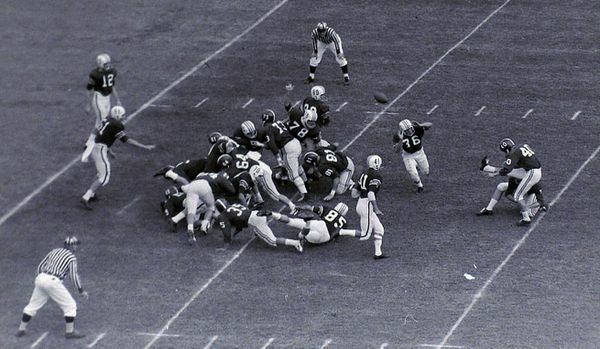 Alabama cruised to a 34-0 win with Pat Trammell at quarterback, Lee Roy Jordan at center and All-American Billy Neighbors at tackle. Nelson remembers Neighbors didn’t get the soccer shoes but wore “high top tennis shoes” for that Auburn game. Auburn threw four interceptions navigating the beat up field in traditional footwear. It wasn’t Ralph Jordan’s best Tiger team entering with a 6-3 record, but they were on a two-game winning streak over Georgia and Florida. The Iron Bowl, however, was never close. The Tide led 24-0 at halftime and a few days later, Bryant’s first national title at Alabama was official. A 10-3 win over Arkansas in the Sugar Bowl completed the perfect 11-0 season. The story of the soccer shoes, however, appeared to be lost to history. Newspaper stories from the time didn’t mention the move. Bryant never mentioned it on his statewide television show taped the day after the game. Nelson recalled wearing them for a while longer in practices before Bryant snapped them up one day never to return.